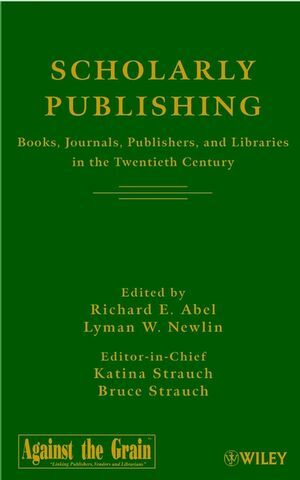 Richard E. Abel and Lyman W. Newlin are the authors of Scholarly Publishing: Books, Journals, Publishers, and Libraries in the Twentieth Century, published by Wiley. Preface (R. Abel and L. Newlin). 1. The Growth of Printed Literature in the Twentieth Century (A. Henderson). 2. Introduction: The Change of Book and Journal Infrastructure: Two Publishers, Consolidation, and Niche Publishers (R. Abel). 3. Growth and Change in Trade Publishing: What I Learned at the Library (S. Vaughan). 4. Growth and Change in Trade Book Publishing: What I Learned From the Numbers (S. Oda). 5. Textbook Publishing (R. Follett). 6. University Press Publishing in the United States (P. Givler). 7. The Creative Role of the Professional or STM Publisher (J. Dill). 8. Diversity and the Growth of Serious/Scholarly/Scientific Journals (A. Henderson). 9. From Bibliotheque to Omnitheque (A. Veaner). 10. Development of Public Libraries (B. Dean). 11. The Growth of Scholarly and Scientific Libraries (H. Edelman). 12. Appearance and Growth of Computer and Electronic Products in Libraries (R. Shoffner). 13. The Economic Crisis in Libraries: Causes and Effects (M. Gorman). 14. The Impact of the Library Budget Crisis on Scholarly Publishing (J. Goellner). 15. The Place of Scholarly and Scientific Libraries in an Increasingly and More Widespread Competitive Information Knowledge Marketplace (C. Hamaker). Conclusion (R. Abel and L. Newlin). Coda (K. Strauch and B. Strauch).